The Key to Success? Doing Less. The first principle of simplicity is: reduce. As odd as it sounds, organizational health and improvement are largely the result of simple, well-known strategies and structures (Pfeffer & Sutton, 2000). In education, this means that the general underperformance of schools is directly attributable to a failure to implement three simple, well-known elements: coherent curriculum, soundly structured lessons, and adequate amounts of fairly traditional literacy activities. We love to talk about these elements, but they are rarely implemented. As Allan Odden writes, our failure to improve schools isn't because we lack funding or know-how. What we lack are the "will and persistence" to maintain a focus on the best practices that we already know but that are grossly underutilized (Odden, 2009, p. 22). As Jim Collins writes, the key to success is not innovation; it is a combination of "simplicity and diligence" applied with fierce, exclusive devotion to what is truly most effective (Collins, 2001b, p. 104). According to Michael Fullan, decades of studies have demonstrated that the key to success is neither innovation nor technology. Rather, it is an abiding commitment to the "smallest number of high-leverage, easy-to-understand actions that unleash stunningly powerful consequences" (Fullan, 2010; emphasis added). This book argues that for the majority of schools, the three elements addressed here meet Fullan's criteria better than all other initiatives combined; they are indeed few in number, exceedingly high-leverage, and easy to understand. You'll find evidence for these claims in every chapter. For that reason, these actions all but guarantee "stunningly powerful consequences." We'll begin with a brief description of the three elements, which will be fully clarified in the next two chapters (and for the subject areas outlined in Chapters 4 through 7). As these elements are so potent, they need not be implemented perfectly or with any special skill. Their impact will be largely realized when most teachers simply apply them reasonably well and consistently. What we teach. This refers to the actual implementation of a coherent, user-friendly curriculum, with topics and standards collectively selected by a team of teachers from the school or district. The number of essential skills and topics must not be excessive; it should reflect a deliberate reduction of the standards contained in our typically verbose standards documents (Marzano, 2003). As we'll see, this especially applies to English language arts (ELA) standards, even in the Common Core era. Such "guaranteed and viable curriculum" (Marzano, 2003, p. 22) is perhaps the most significant school factor that affects learning. But it is found in exceedingly few schools (Berliner, 1984; DuFour & Marzano, 2011; Hirsch, 2016; Marzano, 2003; Schmidt, 2008). How we teach. Think of this as ordinary, structurally sound instruction that consists of just a few elements that educators have known about for decades but that few educators are ever given time and opportunity to master. As we'll see in Chapter 3, these elements were formally codified in the 1960s (but are essentially thousands of years old). The pivotal feature of such instruction is the conscientious effort, throughout the lesson, to ensure that all students are learning each step or segment before the teacher moves on to the next one. If such instruction is implemented with any consistency, its impact would be as powerful as any action schools would take (Black & Wiliam, 1998; Wiliam, 2007). Authentic literacy. This is integral to both what and how we teach. It is, in the words of Phillips and Wong, the "spine" that "holds everything together" in all subject areas (2010, p. 41). In this book, "literacy" or "authentic literacy" simply means purposeful—and usually expository, argumentative, or interpretive—reading, discussion, and writing (Lunsford & Ruszkiewicz, 2009). Authentic literacy embraces the best aspects and emphases of the Common Core, but (as will be explained) it rejects the bulk of the grade-by-grade minutiae found in the standards documents. Genuine literacy is still the unrivaled key to learning both content and thinking skills. But it is categorically different from the so-called "reading skills" and pseudo-standards that continue to wreak havoc in language arts. We'll examine the case for very different kinds of literacy standards—and skills—in Chapter 4. Implementation of the elements just described will benefit immeasurably when teachers work in teams—that is, in true "professional learning communities" in which curriculum, units, and lessons are continuously developed and refined on the basis of assessment results (DuFour & Marzano, 2011; Schmoker, 2006). A focus on these three elements would have more impact than all other initiatives combined. In the majority of our schools, they will ensure that record numbers of students are prepared for college, careers, and citizenship. They would wholly redefine what schools can accomplish with children from every socioeconomic stratum. Because of this, their implementation should be our most morally urgent, jealously guarded priority: the ongoing focus of every team meeting, every professional development session, and every faculty and central office meeting. Until these elements are reasonably well implemented, it makes little sense to chase after new programs, technology, or other innovations. Once these elements are implemented, any evidence-based innovation is fair game, as long as it does not dilute or distract us from these always-vulnerable priorities. Does this sound too "simplistic"? Can such simplicity really be the elusive key to better schools? To get some perspective, let's step outside our own profession for a moment. Consider a football team that loses about half of its games, year after year. (This is a bit autobiographical; I coached football for a short time.) Each week, the coaches scour the Internet to find new, complex plays. This confuses the players, who never mastered the last set of plays. All the while, the coaches never take note of something boring but important: the performance of their offensive line. If they paid closer attention to what every coach knows, they would see that their linemen have never mastered the timeless fundamentals of effective blocking, such as footwork and body position. These fundamentals make a literal "game-changing" difference. Therefore, the solution to this team's mediocre performance is quite simple: stop introducing new plays and start focusing strenuously on the most mundane but hugely effective blocking techniques until they are mastered by all of the lineman. The results would be immediate and significant. Now imagine a hospital in which infection rates are high. (This is a true story.) Internal research reveals this to be the number one cause of illness and mortality at that location. All of the staff know the small handful of procedures that inhibit infection. According to one doctor, these "are no-brainers; they have been known and taught for years." But, alas, doctors and staff don't implement them consistently, even as they continue to attend various conferences and training sessions in complex, cutting-edge practices and procedures. In fact, the hospital (like the football coaches) seldom acquaints the staff with the ironclad case that these simple, well-known hygienic procedures are directly linked to life, death, and infection rates. The solution to this hospital's problem is simple, not complex: the powerful evidence for these practices is shared with staff, and then a short checklist is generated, followed by training in each of the procedures. In addition, the use of the checklist is monitored to ensure that all medical staff implement these practices consistently. The result? In two years, the infection rate plummets from 11 percent to 0 percent. These simple, easy-to-implement measures also prevent eight deaths during that period and save the hospital approximately $2 million in malpractice lawsuits (Henig, 2009). If we educators can't see ourselves in these two examples, I fear for us. They clarify why so many schools fall short of their potential: because we have yet to focus our time and attention on the mastery of simple, familiar practices that would have the swiftest and most significant impact on achievement (i.e., the implementation of common curriculum, effective lessons, and authentic literacy). We don't even share the evidence for why these deserve to be our highest priority. Our failure to be clear and focused prevails even as we continue to attend conferences, workshops, and book studies; as we adopt complex programs and initiatives; and as we largely ignore these elements in the overwhelming majority of American classrooms (DuFour & Marzano, 2011; Hirsch, 2016; Pianta, Belsky, Houts, & Morrison, 2007; Schmoker, 2006). If you or your staff do not already implement a reasonably sound, common curriculum that (1) is taught with the use of the most essential, well-known elements of effective lessons, and (2) includes ample amounts of meaningful reading and writing, then please don't sign up for this training. It will have no effect on learning in your classroom or school. Master the above fundamental practices first. Then, if you still need this workshop (and you might not), we look forward to seeing you. Have a nice day. Priority is itself a function of simplicity. It dictates that we select, clarify, and then focus on only a few things at a time: what is most likely to help us achieve our goals. Education has never been so beholden to complexity, the enemy of clarity and priority. This is especially apparent in our complex teacher evaluation templates (Dreilinger, 2013; TNTP, 2013) and our inanely-phrased standards documents (Garner, 2010; Ravitch, 2013; Schmoker & Graff, 2011). Three books can help us to correct this. Jim Collins's book Good to Great (2001a) is the best-selling organizational improvement book of the last generation. Collins found that "the essence of profound insight" into organizational improvement "is simplicity" (p. 91). That's why he reveres the hedgehog of Aesop's fables, who does one thing well (rolls into a ball to protect itself), as opposed to the fox, who plans and plots as he "pursues many ends at the same time." Foxes aren't simple; they are "scattered and diffused, moving on many levels" (p. 91). That's why they fail. In contrast, hedgehogs focus only on "what is essential and ignore the rest" (p. 91). On some level, the educational community knows "what is essential." But it has never clarified or reinforced its priorities assiduously. In addition, it is especially difficult for us to "ignore the rest": the endless parade of new programs or innovations that distract us from those few, powerful actions and structures that are the soul of good schooling. An ironclad law is at work here: we will never master or implement what is most important for kids if we continue to pursue new initiatives before we implement our highest priority strategies and structures. Collins (2005) had schools in mind when he wrote that "social-sector organizations" must overcome their addiction to doing too many things. To succeed, they must "attain piercing clarity" about what is truly most effective and "then exercise the relentless discipline to say, 'No thank you' to opportunities that fail the hedgehog test" (p. 17). Simplicity, clarity, and priority are intimately linked. For an organization to maintain a focus on its highest priorities, it must routinely clarify them so that everyone in the organization knows implicitly what to do and what not to do. Priorities are fragile. If they aren't regularly clarified, practiced, and refined, they are always at the mercy of our natural forgetfulness, and a failure to protect them from the encroachment of new, but far less effective, practices or programs. According to Jeffrey Pfeffer and Robert Sutton in The Knowing–Doing Gap, leaders resist simplicity but are enamored with novelty and complexity. This tendency prevents them from implementing their core priorities (Pfeffer & Sutton, 2000, p. 33). The result is stagnation or decline. "Complexity," the authors warn, is the enemy of effective action and implementation. Worse still, leaders have a bias against "old ideas and simple prescriptions," even though these old, simple ideas are the key to better results (p. 53). Many leaders would rather launch new initiatives because it excuses them from the harder work of ensuring that their highest, simplest priorities are implemented—that is, are "actually done" (p. 54). In contrast, the most successful leaders are those who know that "success depends largely on implementing what is already known" (p. 14; emphasis added). They know that "simple prescriptions" conveyed with "clarity and simplicity" are the hallmarks of effective action and leadership (p. 55). At the successful companies profiled by Pfeffer and Sutton, the primary driver of improvement was "the implementation of simple knowledge" (p. 15). It is critical that schools learn that "best practice" is rarely new practice. On the contrary, the most effective actions are "well-known practices, with the extra dimension that they [are] reinforced and carried out reliably" (p. 14). Are the most effective, evidence-based practices "reinforced and carried out reliably" in our schools? Usually not, according to every credible study going back to the 1970s (Darling-Hammond, 2010; DuFour & Marzano, 2011; Hirsch, 2016; Schmoker, 2006). To ensure that they are, we must make continuous efforts to clarify, reinforce, and reward their mastery and implementation by teams and teachers. Which brings us to the findings of Marcus Buckingham. In The One Thing You Need to Know, Marcus Buckingham (2005) reinforces the principle that we accomplish more when we focus on less. He found that successful organizations carefully determine their focus and then make every effort to clarify and simplify those priorities. According to Buckingham, survey data reveal that employees crave clarity; they want to know precisely what they must do to be most effective—and not be distracted from that. Their highest priorities must be clarified incessantly. "Clarity," writes Buckingham, "is the antidote to anxiety … if you do nothing else as a leader, be clear" (2005, p. 146). In his interviews with employees in multiple organizations, he found that "everywhere, the wish was the same: 'Get me to the core'" (p. 3); that is, "relentlessly clarify our primary focus—and then let us concentrate on it alone." And protect us, as DuFour (2007), in reviewing Buckingham's book, writes, from new initiatives that wash upon school employees "in waves" (p. 69). To protect the core, leaders must "sift through the clutter" in order to "apply disproportionate pressure in a few selected areas" (Buckingham, 2005, p. 188). 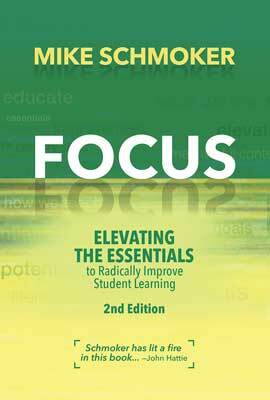 This "lopsided focus" fuels people's productivity, creativity, and morale (p. 26). Less is more. Leaders must be seen as clarifiers, focusers, "keepers of the core" who incessantly "cut through the clutter … to distinguish between what is merely important and what is imperative … those few things you must never forget" (Buckingham, 2005, p. 26; emphasis added). And the core must be monitored obsessively: as Buckingham writes, "you get what you inspect" (p. 176). Let's now look at how these principles play out in some of the organizations Buckingham describes. Their implications for schooling will be obvious. Carefully protected focus at Best Buy. Research revealed that the "core" for Best Buy's sales force was the ability to master and then confidently explain the different features of the products they sold. That's it. Since making this discovery, Best Buy reduced their product line by 50 percent so that salespeople could fully master their core inventory. To preserve the core, they try to discard an existing product every time they add a new one. This is the secret to the company's success (Buckingham, 2005, p. 155). Apple Computer and one thing. Apple Computer was constantly invited to embark on new initiatives and partnerships. But Steve Jobs strenuously resisted heavy lobbying from those within and outside of the company and stayed true to one thing: "figuring out how to invent cool technology but making it wonderfully easy to use." Jobs was as proud, he said, "of the things we have not done as I am of the ones we have done" (Buckingham, 2005, p. 165). Borax: safety at the core. The Borax mine is north of Edwards Air Force Base in California. The company's in-house research revealed that its simple core was safety: if it could keep its employees safe from on-the-job accidents, then morale, efficiency, and profitability would take care of themselves. And they did—on every metric (Buckingham, 2005, pp. 167–174). Borax officials knew that the key to protecting the core focus was communication. Leaders constantly reminded, trained, and told stories to make sure that people understood the outsize importance of safety procedures. Every meeting began with an anecdote about how injuries were averted by employees. Leaders displayed and celebrated measurable benchmarks, such as the number of days without an accident, and progress toward monthly and annual accident-reduction goals. Profits soared commensurately. In schools, leaders should collect, share, and celebrate analogous data (e.g., on the percentage of classrooms in which common curriculum, sound lessons, and authentic literacy are being consistently implemented). We should celebrate progress in these areas as we guide and advise teachers at faculty meetings. And we should celebrate gains made each grading period on common assessments that themselves reflect the level of implementation of these three areas. What happens when an individual teacher or a whole school focuses on the most effective, high-priority practices? The following cases are instructive. Some might remember a teacher I described in Results Now (Schmoker, 2006). His teaching consisted of the oldest, best-known practices. His only "technology" was an overhead projector. I observed him a few times during his second year at the lowest-achieving high school in our community. I noted that all he did was actually teach a sound English curriculum, rich in reading and writing, using ordinary, structurally sound lessons. I will elaborate on such lessons in later chapters, but in essence, his whole-class lessons started with a clear learning objective. He then taught in short instructional "chunks," punctuated by multiple cycles of guided practice; brief, purposeful pair-share opportunities; and "checks for understanding," followed by reteaching, when necessary. None of his teaching reflected any recent innovations whatsoever. The result? The success rate in his classes alone was so high that his entire school made the largest writing gains in the state (85 percent of students passed the high school exit exam, up from 59 percent). Moreover, his school outperformed the other two schools in the city, despite their overwhelming demographic advantages. His simple, effective teaching and curriculum obliterated the socioeconomic factor for his students—in a single school year (a phenomenon we'll find in multiple schools described in this book). Years ago, I was fortunate enough to teach at a middle school in which both curriculum and instructional priorities were made crystal clear. They were clarified in the interview process and reinforced at every faculty and department meeting. For those of us teaching English, priorities included the expectation that we taught structurally sound lessons (in which we had extensive training and follow-up) and that students would learn to write effectively by completing two substantive, career-/college-preparatory writing assignments per grading period. These priorities were reinforced and clarified at faculty and department meetings. In addition, leaders routinely monitored to ensure their implementation. Professional development was focused exclusively on these priorities, and it was internal, provided largely by department heads. In addition to classroom observations, school leaders met with teams briefly, each quarter, to discuss end-of-quarter evidence of student performance for improvement purposes (e.g., grade book data, the number of books read and papers written). If these conferences or observations revealed that we needed help implementing the curriculum or sound instruction, we were mentored by an effective teacher until we had improved our performance. As a result of such simple, focused efforts, virtually every teacher in that school actually taught the curriculum and consistently provided sound lessons, almost every day. At this school, there was no test preparation whatsoever, but our test scores were among the very highest in the state—sometimes the highest. Of more importance, all students in that school read and wrote more—and vastly better—than students in typical schools. Simpler still: administrative advancement was based on the aspiring administrator's demonstrated proficiency in teaching the curriculum effectively. There were no annual initiatives, no new innovative programs or "strategic plans" to get in the way of our simple core: a year-to-year insistence on sound curriculum, sound instruction, and authentic literacy. Until these core practices become common practice, schools need to focus almost exclusively on them alone. We must be sure that what we want from our schools is precisely what we communicate—simply, clearly, and persistently. If we wish to educate unprecedented numbers of students, the ball is in our court: we need to be as obsessive about our "core" as Best Buy, Apple Computer, Borax, and the schools discussed in this chapter are about theirs. we need, as Collins tells us, to define our priorities with "piercing clarity" and then say, "no, thank you" to anything that would divert us from successfully implementing them. In the next two chapters, I will clarify the features of the three elements, which I believe should be our core priorities. I will also provide their unrivaled evidence base, which we have a moral and professional obligation to honor—because good-faith efforts here would indeed result in "stunningly powerful consequences" for our students.